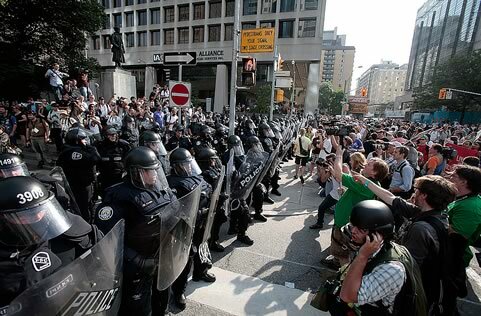 The massive police presence in Toronto over this week has been officially justified on the basis of protecting the leaders of the G8 and G20 countries meeting in Huntsville and Toronto. We were told that the creation of the fenced-in fortress, the massive mobilization of police (estimates ranging from 10-20,000) from across Canada, and even the passing of a secret law on policing (by the executive of the Ontario government without reference to the Legislative Assembly and the opposition parties) that made it a crime to appear within five metres of the security fence would protect our right to protest as well. This is not what has unfolded in Toronto over the weekend. There seemed to be no real efforts on the part of the police to stop the attacks on the stores. As well, none of the massive police contingents tried to stop some of this small group from burning three of their police vehicles. It was as if the police weren’t all that concerned with these actions. Reporters from European broadcasters and newspapers reported that this was totally out of keeping with any real concern to prevent violence. The police then unleashed waves of repression against the legitimate protesters, those who wished to push toward the security fence – in an effort to challenge the militarization of the streets and demand that the G20 leaders respond to concerns about austerity and attacks on poor and working people – those who were simply voicing their concerns about the G20 agenda (with its radical austerity agenda of having the public sector and the poor pay for the bailout of the banks), journalists and even innocent and curious bystanders. In one attack on a “free protest” zone (previously negotiated with the police) rubber bullets and tear gas was used, and people were indiscriminately taken down, beaten and arrested. In all, by Sunday morning estimates were that some 500 people were arrested (and there have been hundreds more over the course of today); it is impossible for anyone to know how many of these were the instigators of violence and how many were people simply exercising their right to protest. But clearly the mass majority were only protesting and exercising their rights to assembly and free speech, which the Toronto police and the wider security forces have been systematically violating. The temporary jail that protestors have been placed in is located at the old Toronto Film Studios on Eastern Avenue in the eastern edge of the downtown, converted into a series of cages in essentially a huge warehouse. The jail is described by inmates as a kind of Guantanamo North: cold, dirty and especially humiliating for those who were said to have refused arrest. People have been held for hours without recourse to legal representation, of which there has been a large legal team at hand. Protesters hoping to provide some type of support for those incarcerated, have themselves been attacked, tear-gassed and dispersed by police violence. Listening to the mass media and the interviews with the police and security spokespeople for Toronto and the Canadian state, one would have thought that there was full scale rioting, and that the massive, billion dollar spending spree on security for the Summit – that angered people across the country – was somehow worth it. As part of this, all protesters are being demonized and the police are being portrayed as heroes, notably by the political leadership and the Mayor of Toronto, David Miller. The message of the protests (and of the thousands who protested across the week at hundreds of talks, meetings, protests, cultural events) – that the G20 meeting reflected the underlying agenda of the corporations and the political elites, to make sharp cutbacks across the public sector, to impose wage cuts, to not raise significant (or any) new taxes on financial capital and to impose new forms of hardship in the form of higher taxes and cuts in benefits for working people and the poor – was to be drowned out in a demonizing of the entire project of the protest. That is, that the ruling classes in the G20 were doing everything in their power to have the working classes pay for the crisis and their project of re-constructing neoliberalism and the political hegemony of the banks and financial capital. The police and much of Toronto’s political and economic establishment, sought to use the incidents to change the entire discourse of the G20 week. Socialists, of course, take their distance from the foolish acts of the few who confuse violent attacks and trashing with revolutionary politics. This is to substitute individual acts of dissent for the working class and the mass movement as a whole. It is the adventurism that calls forth the most violent features of the security and policing apparatuses of the state, catching hundreds of innocents in the wake, and helps justify to the endless expansion of the security state. To challenge the neoliberal globalization agenda of the G20, and overturn all the undemocratic exploitative relations of capitalism, we need to build a political movement in Canada, based among the working classes who don’t earn their income from capital ownership, and who also are oppressed by the unequal relations of race, gender, sexuality and nationality. At this moment, it is a point of fundamental solidarity to denounce, as forcefully as possible, the police repression being unleashed against G20 protesters. We insist that those incarcerated on Eastern Avenue have their full civil rights restored and that civilian authorities take control from the Toronto Police Services of oversight of these proceedings. They have proven incapable of protecting – and understanding – basic civil rights (starting from the special emergency powers asked for by Police Chief Blair, and granted by stealth by Premier Dalton McGuinty). The accused should immediately be released without charge, or be freed on bail and given the right to defend themselves in open courts (not the kangaroo courts with limited or no public access that have been operating over this week). The police occupation of Toronto should end immediately, and our full civil rights – and especially our rights to our city and streets – be restored. There clearly will need to be a full and independent investigation about the role of the police in the violence of the last few days, the role of agent provocateurs and plants in the planning of these events and the astonishing violation of the rights of ordinary people and protesters alike on the streets of Toronto over the last week.